Hi Rel Alloys or High Reliability Alloys are alloys that are used in environments where metal parts and components are under significant stress, or alloys whose reliability, corrosion resistance and other properties are essential for safeguarding systems operations and-in some cases-human life. Alloy QA/QC for these mission-critical alloys is essential to operating a profitable business, to keeping important electronic components in working order, to keeping aircraft in the air, to keeping underwater pipes from bursting and causing expensive damages, and to a variety of other critical alloy applications which require highly specific compositions in order to function safely and reliably. Contact Bruker today to find out more about BrukerHandlheld XRF analyzers, a highly reliable tool for high reliability alloy QA/QC. Today, every industry is concerned in one way or another with high-reliability alloys, their relationship to their overall supply chain, and the need to verify the alloy composition of high-reliability components. Electronics alloys, for example, have undergone vast changes within the last decade, largely driven by regulatory demands such as the EU’s RoHS requirements. While the consumer products and consumer electronics industry has largely switched away from the traditional high-reliability SnPb (tin-lead) alloys to new formulations, electronics in the medical, aerospace, and defense industries have had to take Pb-free exemptions. This has created additional materials testing and compliance challenges. The majority of the components supply chain has converted to Pb-free in order to serve the largest number of customers that now comply with RoHS and other Pb-free regulations, and therefore have little motivation to continue producing SnPb components. The industries that have taken Pb-free exemptions, however, have a vetted interest in keeping the SnPb supply chain thriving, and in being able to quickly separate SnPb from Pb-free materials. Regardless of whether your particular industry relies on Pb (lead) alloys to maintain alloy reliability in electronic components and eliminate potential risks such as tin whiskers, or whether you must comply with Pb-free regulations and are using high-reliability Pb-free alternatives, the need for alloy QA/QC grade identification and verification is essential. 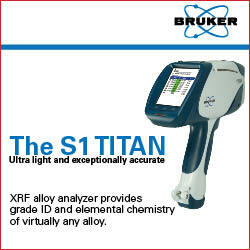 A customizable alloy library for quick, easy alloy identification by grade. While the alloy library is complete with everything from common to exotic alloys and their compositions, it is also fully customizable so users can add new formulations as they become available. Very fast and easy to use. Even the novice user can identify most alloys and their composition within 2-5 seconds (Light Element alloys containing Si, Mg, and Al take a few seconds longer). Regulatory compliance made easy. For example, the instrument comes pre-programmed with pass-fail settings for EU-RoHS compliance. Nondestructive testing - test products from beginning to end of your manufacturing process, with absolutely no effect on materials or finished products.